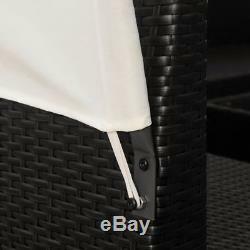 VidaXL Outdoor Lounge Set 34 Pieces with Canopies Poly Rattan Black. What can be a better way to reward yourself and your family than with a highly comfortable outdoor sofa set? This elegant rattan lounge set, including a matching coffee table, soft cushions and pillows, and practical canopies, will be a perfect choice for you to fully relax and enjoy the weather, or to chat with your family or friends over a cuppa on your patio or in your garden. 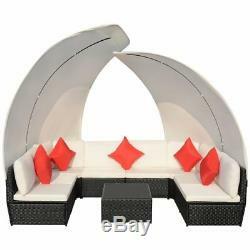 The outdoor lounge set features a sturdy steel frame, which makes it highly durable. Thanks to the weather-resistant and waterproof PE rattan, the sofa set is hard-wearing, easy to maintain, and ideal for year-round outdoor use. The coffee table has a glass top which is easy to clean with a damp cloth. The patio furniture set is lightweight and modular, which makes it completely flexible and easy to move around to suit any setting. The sofa set is delivered with comfy seat and back cushions. The vibrant red pillows will add a splash of color to your outdoor living space, while providing extra comfort. The canopies not only protect you from the sun, but also add a touch of elegance with their striking appearance. Note 1: We recommend covering the set in the rain, snow and frost. Assembly is required; all tools, hardware and instructions are included. 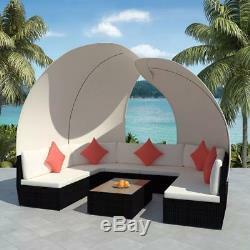 Canopy & cushion color: Cream white. Material: PE rattan + powder-coated steel frame + glass table top. Cushion & pillow material: Fabric. Overall dimensions: 102.4" x 74.8" x 86.6 (W x D x H). 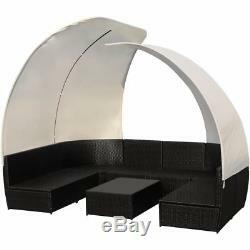 Center sofa segment dimensions: 23.6" x 26.4" x 26.4 (W x D x H). 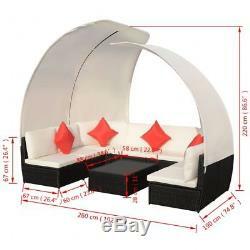 Corner sofa segment dimensions: 38.6" x 28" x 26.4 (W x D x H). Seat height from the ground (measured without cushion): 11.8. Seat cushion thickness: 2.8. Coffee table dimensions: 34.6" x 22.8" x 11 (L x W x H). Pillow size: 15.7" x 15.7" (L x W). 6 x Center sofa segment. 2 x Corner sofa segment. Our customer service will be happy to help. We look forward to your positive and detailed review with 5 stars. The item "VidaXL Outdoor Lounge Set Canopy 34 Piece Poly Rattan Wicker Black Garden Sofa" is in sale since Wednesday, April 25, 2018. Seat height from the ground (measured without cushion): 11.8"